Well Go U.S.A. has selected Apr. 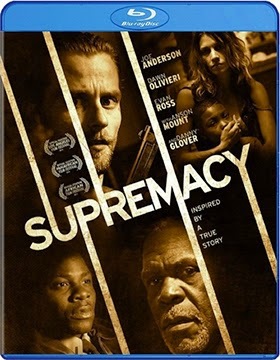 21 as the DVD and Blu-ray release date for director Deon Taylor’s cat-and-mouse thriller, Supremacy. A showcase theatrical run is currently running its course to garner critical awareness … the film worked the festival circuit last summer before being picked up by Well Go U.S.A. for domestic distribution. The story, which is drawn from actual events, gives one pause as to making any assumptions about how this, or any other, day might unfold. A seemingly routine day can be anything but that … death awaits with only luck and fast thinking keeping it at bay. The film jumps right in with the release from prison of Garrett Tully (Joe Anderson — The Twilight Saga: Breaking Dawn - Part 2, The Crazies, The Grey etc. ), a poster boy for rage, racism and downright stupidity. He’s scraping the bottom of the gene pool and has been doing hard time for past sins and in the process of his “rehabilitation” he’s become a soldier for the Aryan Brotherhood. You can’t help but think, as he makes his way to his ride, that society would be best served by leaving this tattooed scum to rot in prison … there is no useful purpose in having him back on the streets. But it doesn’t work that way. His ride, a stranger, is a piece of hard road by the name of Doreen (Dawn Olivieri — as Andie Star in The Vampire Diaries), who looks strung-out and, in a word, pathetic. What wrong turn did she make on her personal highway to hell … but that’s another story. She has an assignment for him — delivered by his prison master — but before they can get to work they are pulled over by a state trooper, which sets Tully into panic mode. That encounter doesn’t end well. So there is your preface to this story that is about to take a nasty turn. A racist convict gets paroled, is picked up by white trash and a cop is killed. They are now on the run and select a seemingly empty rural hideaway to lay low … welcome to Mr. Walker’s home! The place isn’t empty after all. It’s the home to Mr. Walker, a black man (Danny Glover) and his wife, which means that they are expendable. But if that were to happen, then we wouldn’t have much of a story. As “luck” would have it, Walker is also an ex-con, and if the truth be known a bit of a sociopath, who quickly sizes up the situation and sets to work — for survival sake — on manipulating Tully and Doreen. The bulk of the film plays out here and filmmaker Deon Taylor does an exceptional job of creating a claustrophobic tinderbox that becomes the set piece of rage, mind-games and hidden truths (lies). The tension builds and the ultimate outcome is never clear! Yes, you never know how the day will unfold … director Deon Taylor’s Supremacy is the perfect case in point. Derrick and Patrick are identical twin brothers (played by Steven Molony, who also provided the script — The Moment After, Pinching Penny), with recent college degrees and little in the way of career prospects. Adult slackers! 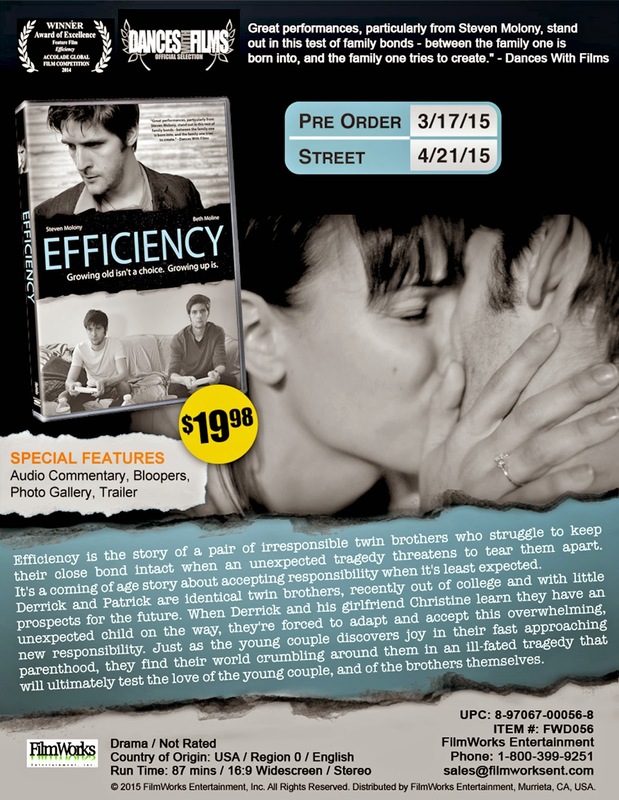 That’s the set-up for director Kate Enge’s award-winning “dramedy,” Efficiency, which is heading to the DVD market place on Apr. 21 courtesy of FilmWorks Entertainment. Derrick is the dominant of the two, while Patrick is content to follow his lead. They are affable, intelligent and good-natured … high school became college and that is now behind them, but being adults had yet to fully settle-in. Few plans have been made, but they are having a good time. That’s a bit of a façade in that there is that nagging fear … what’s next? Derrick would love to be a writer, but if the truth be known, he’s currently better at PlayStation games — those great time “suckers.” Writing is just a thing. He’s also in a relationship with a beautiful young woman named Christine (Beth Moline, making her feature film debut her), who would like to perfect her piano playing, but she too is adrift. Meanwhile, Patrick is content to play the field. Party. 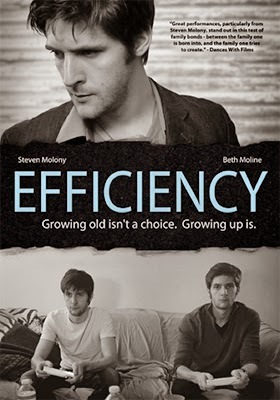 Filmmaker Kate Enge’s Efficiency is something of an anthem to today’s current generation … educated, adrift and untested. But as we soon learn, life has a way of sneaking up on even those who seem not to care. When a heartbreaking tragedy is thrust upon Derrick and Christine their relationship will be tested, but more importantly the bond between brothers Derrick and Patrick will come into focus and who leads, who follows and who can be strong will turned on its head. Yup, life happens … especially when you are not ready for it!! Bonus features include a blooper reel and commentary from director Kate Enge and writer Steven Malone, who previously collaborated in her 2011 assemblage of short films, The Moment After. 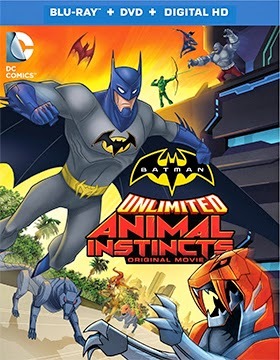 Warner Bros. Home Entertainment has picked May 12 as the street date for both DVD and Blu-ray/DVD Combo Pack editions of producer/director Butch Lukic’s Batman Unlimited: Animal Instincts. This new direct-to-home entertainment feature-length animated film pits Batman (voiced by Roger Craig Smith) — and his super hero colleagues, Flash, Green Arrow, Nightwing and Red Robin — against the notorious Penguin (voiced by Dana Snyder), who has developed a swarm of cyber-attack animals known as the Animilitia. No word yet on any bonus features, but Blu-ray fans will have the option of purchasing a limited edition Blu-ray/DVD Combo Pack (while supplies last) that includes an on-pack Firebat figurine. In other release news this week, Falling Skies: The Complete Fourth Season will be available as either DVD (three-disc set) or Blu-ray (double-disc set) collections on June 2. Bonus features include newly prepared video sessions with series stars, a Comic Con panel video and the “Inside the Episode” interactive feature. 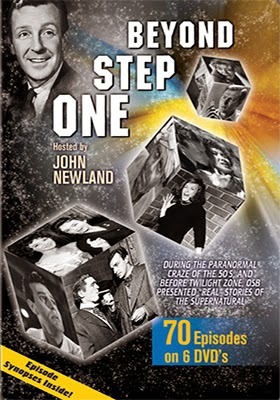 The Film Chest has assembled a four-disc collection showcasing no less than 70 episodes from the legendary 1950’s “supernatural” television series hosted by John Newland, One Step Beyond. The street date is Apr. 7 and price is an easy-on-the-wallet SRP of just $19.98 (for over 28 hours of viewing enjoyment). 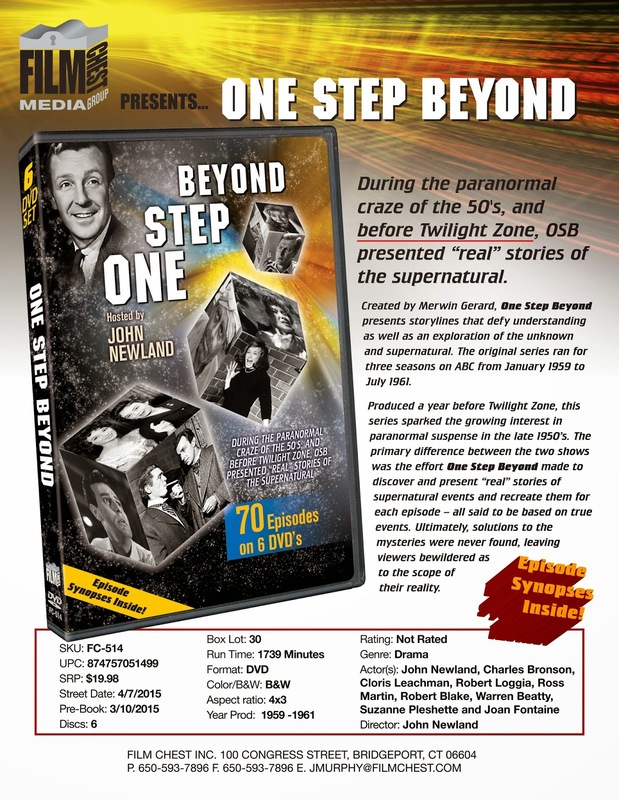 The collection, which features such guest stars as Charles Bronson, Yvette Mimieux, Cloris Leachman, Veronica Cartwright, Louise Fletcher, Elizabeth Montgomery, Warren Beatty and Star Trek's William Shatner comes complete with a detailed in-pack synopsis for each of the eerie beyond-explanation episodes. VCI Entertainment announced this past week that Apr. 28 will be the DVD debut date for The Jerry Warren Collection, Volume Three, a double-feature presentation that contains a pair of hard-to-find prison-themed film classics. First up is director Carlos Hugo Christiansen’s 1954 black and white prison break thriller, The Violent and the Damned. Originally filmed in Spanish and shot on location in the jungles of Panama (which was a bit curious in that it was a joint Brazilian/Argentina film production) and titled Mãos Sangrentas, it was subsequently picked up by Jerry Warren’s A.D.P. Pictures, dubbed in English and released theatrically in 1962. 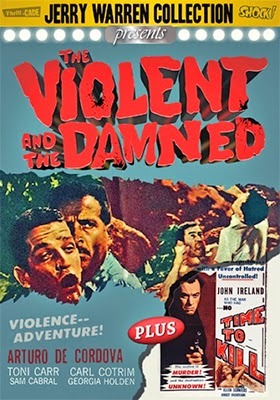 Brutal and sadistic best describe The Violent and the Damned as a group of prisoners, led by Adriano (English-dubbed as “Rick Marson” — played by legendary Mexican actor Arturo de Córdova, a three-time Silver Ariel Award-winner for Best Actor), savagely murder their guards and escape to the nearby swamp. After a bloody encounter at a remote village, the pursuing guards simply decide to wait the remaining convicts out … the swamp will deal with them!!! 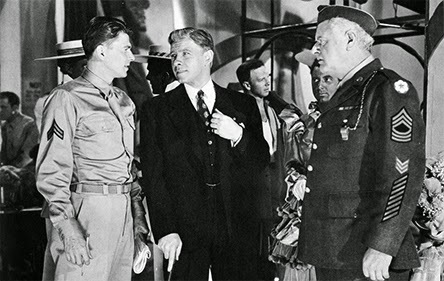 The double-bill, also an A.D.P. Pictures pick-up, is director Tom Younger’s 1959 (released theatrically in the United States in 1963) made-in-Sweden tale, No Time to Kill, which stars John Ireland as Johnny Greco, a wrongfully-convicted man who served eight long years in prison … and now he’s out of stir with revenge on his mind! The trail leads him to, well, Sweden of course, where he plans to frame the man for the crime that he really committed, but is surprised to learn that he’s already dead! But that’s only the tip of this chilly iceberg as Greco uncovers the real culprit … and that is the shock-of-shockers!!! The Film Detective announced this past week that Mar. 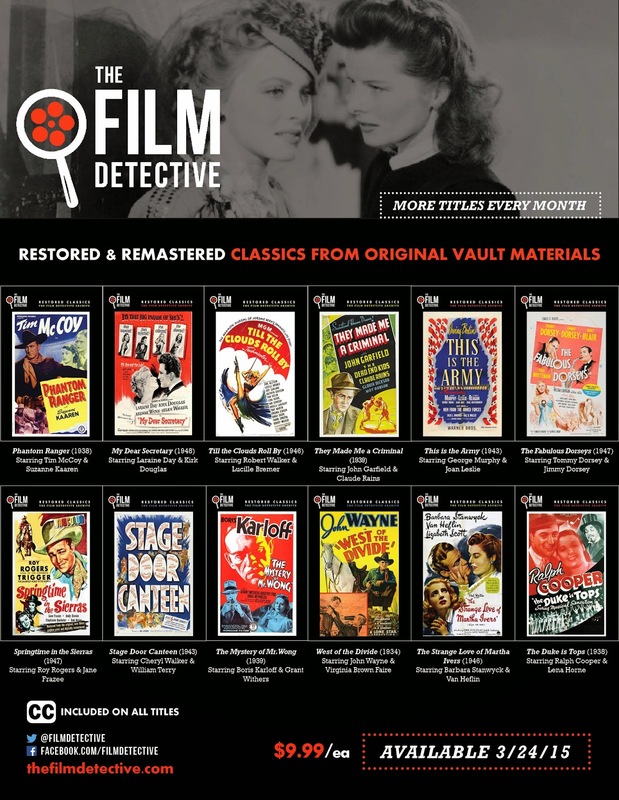 24 will see a dozen new film restorations prepped and ready for delivery to the DVD market place at the priced-to-own SRP of just $9.98. Where does one begin? 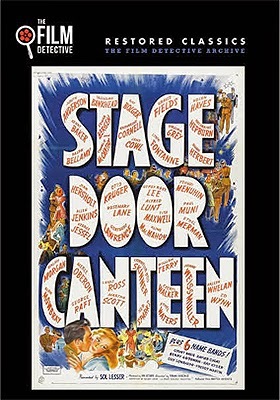 How about with the all-star musical/variety film selections of Stage Door Canteen (1943, director Frank Borzage brings out the stars at this famed New York City venue … Tallulah Bankhead, Judith Anderson, Edgar Bergen and his pal Charlie McCarthy are joined by the likes of Gracie Fields, Ray Bolger and Katharine Hepburn as they entertainment the troops) and This is the Army (also 1940, directed by Michael Curtiz and starring George Murphy, Joan Leslie, Kate Smith and future president, Ronald Reagan). Continuing in the “entertainment-themed” realm we find that the Film Detective has ready for release on Mar. 24, The Fabulous Dorseys (director Alfred E. Green’s post-war biopic starring Tommy and Jimmy Dorsey as themselves), Till the Clouds Roll By (1946, a look at the life of musical composer Jerome Kern with Judy Garland, Frank Sinatra, Kathryn Grayson, June Allyson, Lena Horne and Dinah Shore delivering his tunes), Springtime in the Rockies (1942 with Betty Grable, Carman Miranda, Cesar Romero, John Payne and Harry James and His Music-Makers) and the all-black musical drama Duke is Tops (1938 with Lena Horne). For Western fans it is John Wayne in the saddle in West of the Divide (1934, with Gabby Hayes and Yakima Canutt) and Tim McCoy and Suzanne Kaaren star in director Sam Newfield’s 1938 film release of Phantom Ranger (filmed out in Chatsworth, California when that was the “wild west”). Rounding out the newly restored film presentations are My Dear Secretary (1948, Kirk Douglas, Laraine Day, Keenan Wynn, Rudy Vallee and Helen Walker), They Made Me a Criminal (director Busby Berkeley’s 1939 crime drama starring John Garfield, Ann Sheridan, Claude Rains and the Dead End Kids) and The Strange Love of Martha Ivers (director Lewis Milestones’ 1946 film noir gem starring Kirk Douglas, Barbara Stanwyck, Van Heflin and Lizabeth Scott). Olive Films has announced five new Blu-ray selections for delivery to retail on Apr. 21 … it is an eclectic mix! 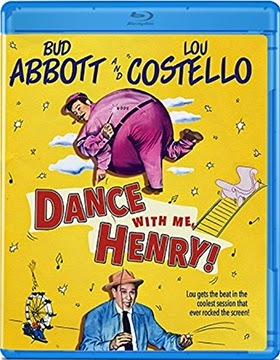 Leading the parade — and that is strictly a matter of taste — is director Charles Barton’s 1956 film release of Dance With Me, Henry, teaming Bud Abbott and Lou Costello for their 36th and final comedy screen appearance together. And yes, that’s former Mickey Mouse Club member Sherry (Sherry Alberoni) playing the role of Bootsie … the orphan girl, Shelley, is played by veteran child star Gigi Perreau, who would transition later in the decade to such teen flicks as The Cool and the Crazy, Girls Town and Tammy Tell Me True and the orphan boy, Duffer, is played by Rusty Hamer (best known as Danny Thomas’ son on the Make Room for Daddy comedy series). 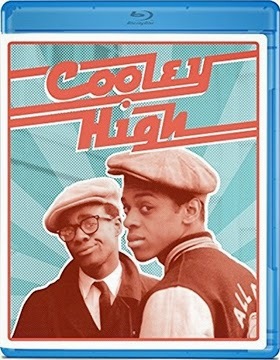 Other comedy releases in the Blu-ray mix are director Michael Schultz’s 1975 film, Cooley High (starring Lawrence Hilton-Jacobs, Glynn Turman and SNL alum Garrett Morris) and director Jason Bloom’s 1996 comedy release of Bio-Dome, starring Pauly Shore and Stephen Baldwin. For action fans, Olive Films has the Blu-ray debut of Chuck Norris, Louis Gossett, Jr. and Melody Anderson in director J. Lee Thompson’s 1986 treasure hunt adventure, Firewalker. The final new-to-Blu-ray selection is the 1995 all-star romantic drama from director Tony Richardson, Blue Sky, which won Jessica Lange the Oscar for Best Actress. Counted among this period piece (circa early 1960s) about nuclear testing and marital strife are Tommy Lee Jones, Powers Boothe, Carrie Snodgrass future comic book hero, Robin (of Batman fame), Chris O’Donnell. Facing certain defeat and the fall of the capitol city of Joseon (aka: Seoul), the disgraced former commander of the Korean fleet (what remained of it) returns and in October of 1597 at the Battle of Myeongnyang (Straits) turns back a vastly superior Japanese invasion fleet. 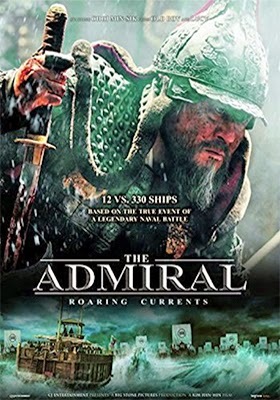 It is all true and this eerily similar Korean version of the English defeat of the Spanish Armada (which occurred just nine years earlier) is the backbone of Korean filmmaker Han-min Kim’s (Warrior of the Arrows, Paradise Murdered) naval battle blockbuster, The Admiral: Roaring Currents. CJ Entertainment America has tabbed Apr. 28 as the release date for both DVD and Blu-ray editions of this international box office smash … even the domestic take for this Korean-language film delivered an impressive $2.6 million in ticket sales (that’s an outstanding number for a foreign-language import). The ARR works out to 263 days. The film is neatly divided into two sections. The first half of the film introduces us to Admiral Yi Sun-shin (Choi Min-sik — Lucy, Tae Guk Gi: The Brotherhood of War, Oldboy, etc. ), the commander of the Korean fleet, who falls victim to corrupt palace intrigues of the floundering Joseon Dynasty and is stripped of his command. During his imprisonment the Japanese nearly decimate the once superior Korean naval forces … the invasion and the fall of the Joseon Dynasty is at hand. 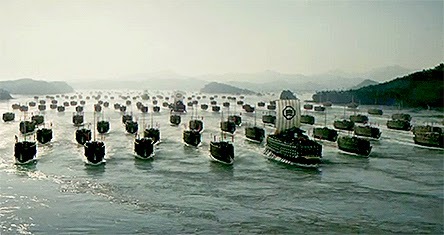 The second half of the film contains one of the most spectacular naval battle sequences ever filmed! Admiral Yi is returned to his command — the fleet has been reduced to just a dozen ships — and is given the impossible task of turning back the on-rushing Japanese fleet of over 300 ships! The rest, they say, is history … Admiral Yi accomplished the same as Sir Francis Drake (an his allies) in turning back a vastly superior invasion fleet … and in Admiral Yi’s case, with the odds heavily stacked against him. If you missed the domestic theatrical run of The Admiral: Roaring Currents, then circle Apr. 28 on your calendar now … this is one that should not be missed!! 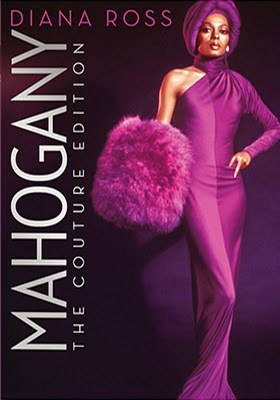 Paramount Home Media will be celebrating the 40th Anniversary of director Berry Gordy’s 1975 Oscar-nominated (Best Song, “Do You Know Where You’re Going To”) film with the DVD release of Mahogany: The Couture Edition on May 5. The world — and politics — of high fashion is front and center and Diana Ross is the focal point in this “Cinderella” tale that co-stars Anthony Perkins and Billy Dee Williams. Bonus features include newly prepared limited edition packaging and a photo gallery of the high-fashion designs showcased in the film. Icarus Films, in conjunction with the KimStim Collection, has targeted Mar. 10 as the DVD debut date for A Spell to Ward Off the Darkness, the three-part experimental film from filmmakers Ben Rivers and Ben Russell that peels back the layers of the life of musician and artist Robert Aiki Aubrey Lowe (aka: Lichens). In the first part, the artist is seen in a communal gathering on the island of Vormsi, just off the coast of Estonia in the Baltic Sea. We then follow Lowe on a solo journey of natural reflection in the remote forest region of Hyrynsalmi, Finland (about 300 miles to the northeast of Helsinki). Once these aspects of Lowe’s life are explored — and his energy is restored in a metaphysical sense — the action for the third segment of the film shifts to Lowe in a live concert performance in Oslo, Norway. 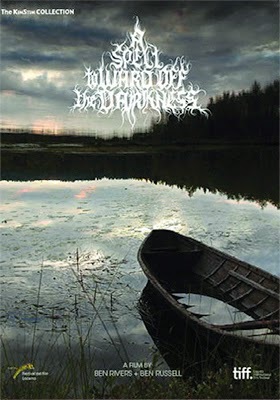 Dark Entity Music, LLC (aka: SGL Entertainment), with sales and distribution expertise provided by the MVD Entertainment Group, has tabbed Apr. 21 for the Blu-ray debut of cult filmmaking legend Ted V. Mikels’ latest film, Paranormal Extremes: Text Messages from the Dead. From the director who gave us such gems as The Astro-Zombies, The Corpse Grinders and The Doll Squad, one thing is certain, Ted V. Mikels has both staying power (an active filmmaker since 1963) and a loyal following. With Paranormal Extremes: Text Messages from the Dead we meet platinum blonde Addison (Colie Knoke), a would-be Las Vegas-based model, who tragically loses her fiancé to a home repair accident. 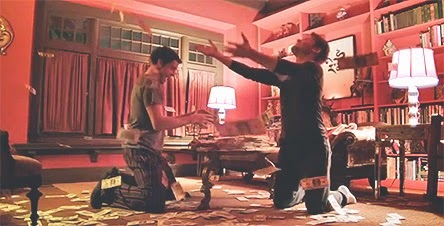 But wait, his love for her is now reaching out from the beyond … or is there something more sinister at play here? Also counted among the cast members is none other than Beverly Washburn (as Elizabeth in director Jack Hill’s Spider Baby and as Lt. Arlene Galway in Star Trek) … and Mikels does a cameo turn. Bonus features for the Blu-ray release of Paranormal Extremes: Text Messages from the Dead include a behind-the-scenes featurette. The Criterion Collection announced its May selections of DVD and Blu-ray film releases this past week … they arrive in two three-titled waves on May 19 and May 26. 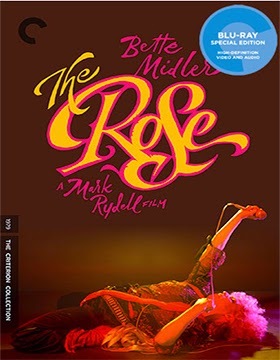 In the first group, arriving at retail on May 19, is a newly-prepared restoration (approved by director Mark Rydell) of the 1979 film release of The Rose, starring Bette Midler (her first of two Oscar-nominations for Best Actress … the other being 1992 release of For the Boys) as Mary Rose Foster, a fictional character based on singing legend Janis Joplin. Alan Bates, Harry Dean Stanton and Frederic Forrest (Oscar nominated for Best Supporting Actor) are her co-stars. Blu-ray and DVD SKUs will be available from Criterion. Bonus nuggets include commentary from Mark Rydell (The Cowboys, Cinderella Liberty, On Golden Pond, For the Boys, etc. ), newly-prepared video sessions with Mark Rydell, Bette Midler and cinematographer Vilmos Zsigmond (four times nominated for Best Cinematography, with an Oscar win for Close Encounters of the Third Kind) and vintage interviews with both Midler and Rydell. 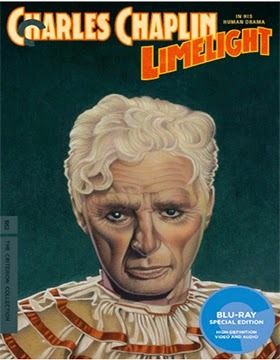 Also streeting on May 19 are newly restored DVD and Blu-ray editions of Charles Chaplin’s 1952 drama, Limelight (with Claire Bloom, Buster Keaton, Norman Lloyd and Nigel Bruce). Bonus goodies here include a new video session with Chaplin biographer David Robinson (author of “Chaplin: His Life and Art”), newly-prepared video interviews with Claire Bloom and Norman Lloyd and two silent short films featuring Chaplin — A Night in the Snow (1915) and The Professor (1919). Lastly, May 19 is the release date for a Blu-ray edition of 1937 tearjerker, Make Way For Tomorrow, starring Beulah Bondi and Victor Moore. Shifting to May 26, the Criterion Collection brings to the Blu-ray format two films from auteur filmmaker Costa-Gavras, State of Siege and The Confession. With the Oscar-win for Best Foreign Language film in 1969 with Z, Costa-Gavras suddenly found himself thrust into the international spotlight … and he delivered two magnificent films in the space of just three years, The Confession (1970, with Yves Montand and Simone Signoret) and State of Siege (1972, also with Montand). The Confession sports a new film transfer (supervised by Costa-Gavras), the 1971 documentary short, You Speak of Prague: The Second Trial of Artur London, vintage video sessions and a newly-prepared video interview with the film’s editor, Françoise Bonnot (Oscar winner for Best Film Editing for Z). Bonus features for State of Siege include a newly-prepared interview session with Costa-Gavras and film scholar Peter Cowie (“John Ford and the American West,” “Ingmar Bergman: A Critical Biography,” etc.) and a vintage NBC News clip featuring Dan Mitrione (on whose life the film was based). Lastly, May 26 brings the Blu-ray and DVD debut of auteur filmmaker Rainer Werner Fassbinder’s little-seen 1971 film, The Merchant of Four Seasons. Bonus features here include commentary from fellow German filmmaker Wim Wenders, newly-produced interview sessions with actors Irm Hermann and Hans Hirschmüller and a new video discussion with film scholar Eric Rentschler (author of “The Ministry of Illusion: Nazi Cinema and Its Afterlife”). 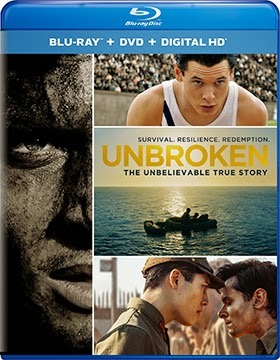 Actress, producer and filmmaker, Angelina Jolie, will see her hit film adaptation of author Laura Hillenbrand’s 2010 best-selling biography of former Olympian (1936) and WWII POW Louis Zamperini, “Unbroken: A World War II Story of Survival, Resilience and Redemption” — shortened for its theatrical release to simply, Unbroken — released on DVD and Blu-ray/DVD Combo Pack from Universal Studios Home Entertainment on Mar. 24. The ARR is a quick-to-market 88 days and box office receipts are $115.1 million. When a gay house-sitting couple discover a mountain of cash it’s time for the fun to being … screwball-style! That’s the news this week from Breaking Glass Pictures, which has tabbed Apr. 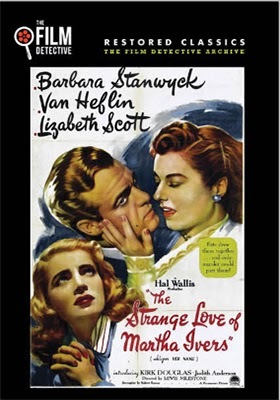 14 as DVD debut date for Stewart Wade’s throwback screwball comedy, Such Good People. 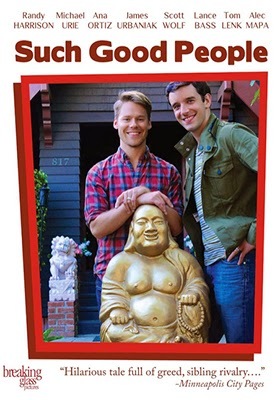 Richard (Michael Urie) and Alex (Randy Harrison) are a happy couple, who couldn’t be happier when wealthy couple, Jake (Scott Wolf) and Chloe (Kate Reinders), invite them to watch over their place while they head off to remote Bhutan for their latest round of “charity” work. What a deal! Word arrives that the philanthropic couple have been killed in a tragic auto accident, but in the meantime the boys have found a secret room full of cash and what appears to be stolen art treasures from the Far East. Perhaps the “charity” work was just a front, but no matter, the cash is a temptation that they simply cannot resist. Bonus features include a blooper reel, deleted scenes and a behind-the-scenes featurette.